UK summers are becoming longer and warmer so it makes sense that ‘outdoor living’ has continued to be a big trend this year. With this in mind, we’ve come up with a novel idea for making the most of your outdoor space this season. To maximise your living space over the drier seasons, you should look to ‘zone’ your garden space into a series of outdoor rooms. In doing so, you can maximise usage of your garden, enjoying separate areas for relaxing, entertaining, growing and so on. What’s more, it’s easy to transform your garden to fit this outdoor living trend, with the help of a few well-placed decorative products including structures such as arches, arbours and gazebos, or even screens and trellis. Even in the case of small outdoor spaces, we believe that it is possible to zone the available area to create distinct al fresco rooms for outdoor living. 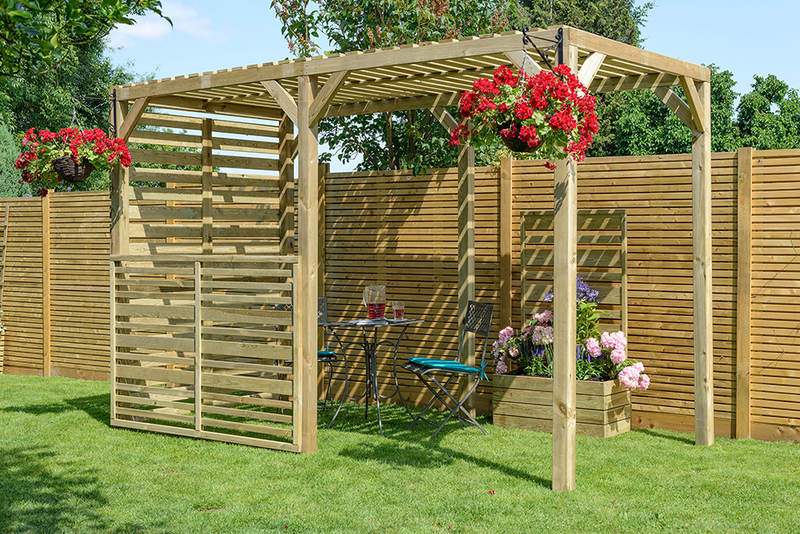 From our versatile Adjustable Garden Screen to our minimalistic Urban Garden Pergola, we offer a wide range of unique timber structures to help break up any sized space without seeming too overbearing. For those who fear they may lack the necessary privacy to enjoy the outdoor living trend to its full potential, why not try our Contemporary Vogue Panel? Benefitting from solid timber slats on both sides of the frame, this elegant yet durable panel can be used to create a more definitive boundary and is ideal for zoning off the garden as a whole or for masking unsightly corners of outdoor space, such as storage areas. With a comprehensive range of arches, arbours, pergolas and panels to select from, it is easy to zone your garden using just a few Grange products. For more inspiration on outdoor rooms and garden zones, visit our Garden Trends page. You can also use our new My Garden feature to design your dream zoned garden.